By 2019, the global market for furniture and floor coverings is forecast to reach $695 billion. Considering the plethora of opportunities present in the industry, marketers are eager to expand their offerings in untapped markets. If you are one of such marketers, Blue Mail Media can help you with one of the most accurate and reliable Furnishing Equipment Executives Database that can take your marketing drive to a next level. 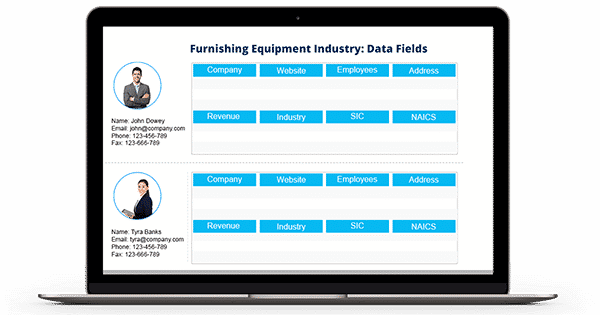 Our database gives you access to all the relevant information you would need to reach your present and prospective B2B customers via telephone, email or mail. Blue Mail Media’s Furniture, Home Furnishing Equipment Industry Mailing List has been designed to help you reach out to the top industry decision makers and stakeholders without passing through multiple gateways in the chain of communication. Our team of data scientists, professionals, and experts follow stringent process for collection, verification and data update to keep our database free of redundancies. Our Furniture and Fixture Industry Email List can be used as one of the most reliable strategic resources in your marketing campaigns. Also, our strong presence across the USA, Africa, China, UK, Russia, India, Australia, New Zealand and other countries helps us provide services to clients in different countries in a global yet local way. Considering the multi-dimensional needs of marketers these days, we provide pre-packaged and custom-built Furniture Equipment Industry Executives List that aligns well with your marketing objectives.